Through the addition of higher skilled Oom Yung Doe instructors, a more personalized training program will be available for any practitioner who is seeking to elevate their skill to the Master Level. Traditional Moo Doe instructors are properly trained to teach Moo Doe principles and movements, which they are recognized for exemplifying through their high level of physical skills and mental abilities apparent in their demonstrations, photos and videos. Oom Yung Doe is constantly seeking highly skilled and well-qualified instructors to continue the growth of teaching Traditional Moo Doe principles in order to better the lives of others. Now, anyone with the motivation and dedication to better their own lives, as well as the lives of their loved ones, will have this opportunity through Traditional Moo Doe. For the first time in the United States, Oom Yung Doe members have an opportunity to learn and develop the incredible skills, abilities, and strengths of Traditional Moo Doe at the master level; thus, it is allowing our members to experience the benefits of Traditional Moo Doe to improve themselves and those that they love, to share this knowledge with others, and to continue this powerful legacy. In a demonstration, a student is lying on his side with three bricks under his head and one brick on top. In this fantastic display of Nae Gong energy strength, Grandmaster “Iron” Kim explosively shattered the top brick without injuring the student. Speed, timing and control are critical as ½ ton of pressure is required to break this brick. This demonstration is very dangerous. 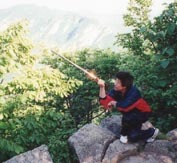 By using the combination of Nae Gong and Wae Gong, Grandmaster “Iron” Kim sliced an apple into 4 pieces with a sword while it was in mid-air. This extremely difficult demonstration requires tremendous speed, precise timing, and pinpoint accuracy. For the first time in the United States, all Oom Yung Doe members – regardless of age, body type, or condition – have an opportunity to learn and develop the incredible skills, abilities, and strengths of Traditional Moo Doe at the Master Level. 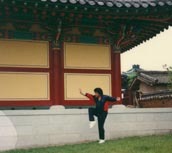 This training is incomparable to ordinary martial arts in that Traditional Moo Doe movements are derived primarily from the movements of animals and from the elements of nature. 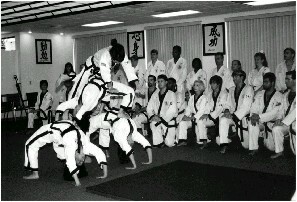 They uniquely use the whole body in many different positions and directions, and are practiced at both slow and quick speeds to build the powerful strength of chi, sometimes referred to as gi. 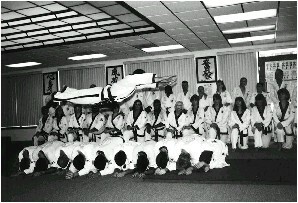 For example, the Tiger Movement (Ho Bar Toop) allows practitioners to develop the ability to move into a very low predatory position, then jump high in the air while making an adjustment toward their striking target. As animals instinctively move in certain ways to maintain balance and harmony, these movements were adapted to properly fit the human form in a way that would achieve the greatest natural benefits, leading to an increase in chi. 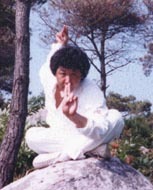 Similar to empty-hand movements, weapon movements follow the same principles, combining the mind, body, and weapon; thus all parts harmonize as one. 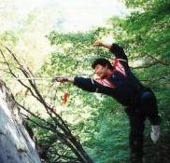 Centuries of research on how to develop chi led further to the development of Nae Gong in humans and its benefit of incredible internal strength, which enhances self-harmonization. Through Traditional Moo Doe individuals can recapture their youthfulness by increasing their will power, developing unused muscles and joints, and maximizing the use of their mind and body. Although the movements are complex, with direction from a Traditional Moo Doe Master any individual can quickly learn and fully develop benefits that otherwise would be unattainable, even with a lifetime of practice. Practicing properly is more important than practicing hard, which can create an imbalanced development; hence, our members realize the value of the knowledge of Traditional Moo Doe and constantly benefit every time they practice by further harmonizing and balancing their development. In this way our members not only experience these benefits of Traditional Moo Doe, but also improve themselves in order to extend their lives and have the time for those they love, to share this knowledge with others, and to continue the legacy. Life is only once so make the right choiceThroughout the centuries, true practitioners of Traditional Moo Doe have been known for developing incredible skills and abilities; both mentally and physically, and it has been the direct benefit to the quality of their lives that has attracted so many individuals over the centuries. By following these time proven and proper training techniques, Traditional Moo Doe has allowed individuals to develop their full potential without wasting time by experimenting with their lives. 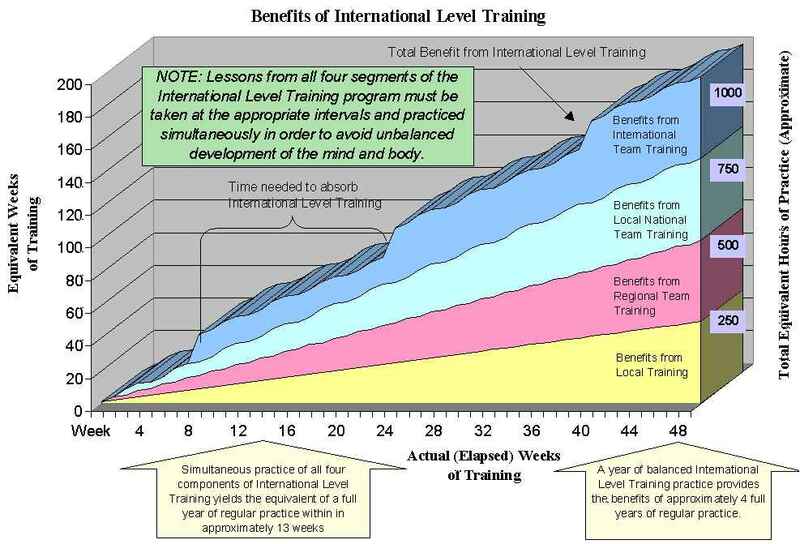 Throughout history there have been those who have wasted their lives believing they can develop these time-proven benefits on their own by combining arbitrary sequences of movement without the necessary understanding of how to balance or complete what they teach (fabricated movement). Teaching this way causes damage to both the instructor and the student. 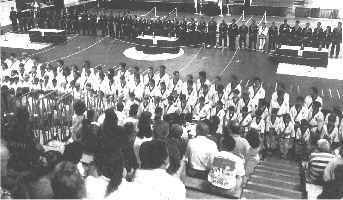 Someone who is choosing to learn this way is spending his or her valuable time experimenting on an untested method and style of martial arts. Although a few of the basic skills can be developed by practicing arbitrary collections of movements, it has been known that practitioners have never been able to achieve the unity of mind, body and spirit which can be achieved through Traditional Moo Doe. No one can replace your time and, more importantly, your life. It’s your choice; so make the right choice. This map illustrates the origin and spread of Moo Doe knowledge which began near the location of the Oom Yung (Yin Yang) symbol. During the Han and Tsu dynasties, Ship Pal Gae (18 Weapons) was developed in China and, later, spread to other regions of Asia. A carved brick from the Western Han Dynasty (206 BC – 24 AD), which was discovered in Chengchow, Honan Province. The way to recognize a Traditional Moo Doe True Master has always been by his/her ability to demonstrate his/her skills, and these five pictures (I,II,III,IV and V) are some examples. 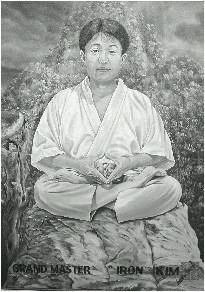 Over the centuries millions of practitioners have sought the lifelong benefits of Traditional Moo Doe which are commonly attained at the Master Level: A superior healthy condition, incredible youthfulness, tremendous longevity, and exceptional peace which all of these lifelong benefits come from true contentment and confidence of having self-harmony. 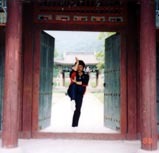 These given demonstrations must not be attempted without the necessary professional training and skills of Nae Gong (Internal Strength), Wae Gong (External Strength), and Kyong Gong Sul Bope (Flying Side Kick – both internal and external strengths). 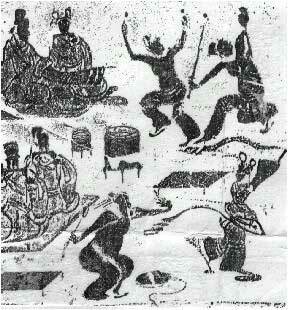 The drawings on the sides depict various Traditional Moo Doe training methods (Foundation Movements). It is very common to find drawings, paintings, or photos which depict Traditional Moo Doe knowledge. The pictures used here come from various sources, but each one shows the strength and knowledge that can be attained through Traditional Moo Doe training.